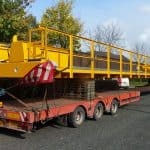 Two double girder cranes were supplied for one of our long longstanding lifting trade clients. 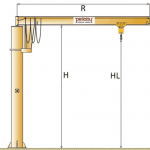 Getting a jib crane or A-frame crane quote just got quicker and easier. One working day quotes for online enquiries are now available. 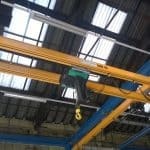 Trackless semi-gantry cranes fitted with anti-collision lasers like this one at BMW Swindon have a number of benefits. Discover more here. We’ve saved one of our biggest projects of 2016 until last. Two 35 tonne cranes are heading for installation at our client’s site. Pelloby are proud to be supporting two talented young local footballers for their upcoming season with AFC Telford United. 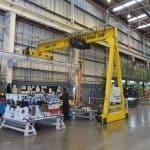 We are delighted to announce that we now offer both the steel and aluminum versions of Verlinde’s Eurosystem overhead handling system. 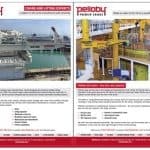 View our latest company flyers for our jib crane, overhead crane and servicing capabilities as well as a company overview. We’re hiring! 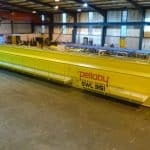 Pelloby are looking for fabricators! We’re on the hunt for experienced fabricators to join our team at Telford. Click here to get all the details about how to apply. 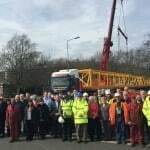 We’re proud all our cranes are produced to the highest of UK manufacturing standards. That’s why we’ve joined the Made in Britain campaign. We decided to kick off the new year in style by launching our brand new website design. Find out about all the upcoming features right here.